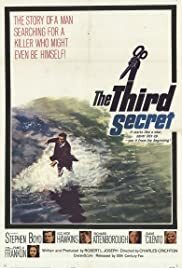 The first secret is what we don't tell people, the second secret is what we don't tell ourselves, and the third secret is the truth. The death of a psychologist is investigated by his teenage daughter and a former patient. In London, the pregnant wife of an industrialist falls down the stairs, loses her sight and has no recollection of the events but suspects that a mentally traumatic experience prior to the fall caused her accident. A devoted secretary risks her life to try to find the elusive woman who may prove her boss didn't murder his selfish wife. Tyrannical, but ailing, tycoon Charles Richmond becomes very fond of his attractive Italian nurse, Maria. The nurse, in turn, falls in love with Charles' ne'er-do-well nephew Anthony, who plots ways to gain control of his uncle's fortune. Twice divorced Hilda Crane feeling she's run out of chances returns to her mother's house in her small hometown and tries to decide what to do next while still hoping to hold onto her independence. That proves to be a challenge. Catherine Whitset: [Stedman is sitting alone in a darkened television studio as Catherine Whitset enters and indicates the broadcasting equipment] It's very complicated, isn't it? Alex Stedman: It has to be. Alex Stedman: It saves people from having to think about what they're really doing. They have to concentrate on how to do it. Catherine Whitset: That's therapy. It doesn't really help. Alex Stedman: Are you looking for anyone? I believe they've all gone home. Alex Stedman: How did you get in? I was the edge of my seat! A suspenseful Who Done It with compelling performances by Pamela Franklin and Stephen Boyd in challengingly complex roles. The plot is fairly progressive for its time - the topic of mental illness still somewhat taboo in our society. I read somewhere that Stephen Boyd was so taken with the story and the character, he took a sizeable pay cut to play the role of Alex. Versatile actor that he was, he seemed to most enjoy those demanding and unusual character roles with substance and depth that really challenge an actor and in which he performed so notably well. And Pamela Franklin, at the age of 14, is an incredible actress taking on a role that veterans would not have managed nearly as well. Great story - great film - great acting! 26 of 32 people found this review helpful. Was this review helpful to you?